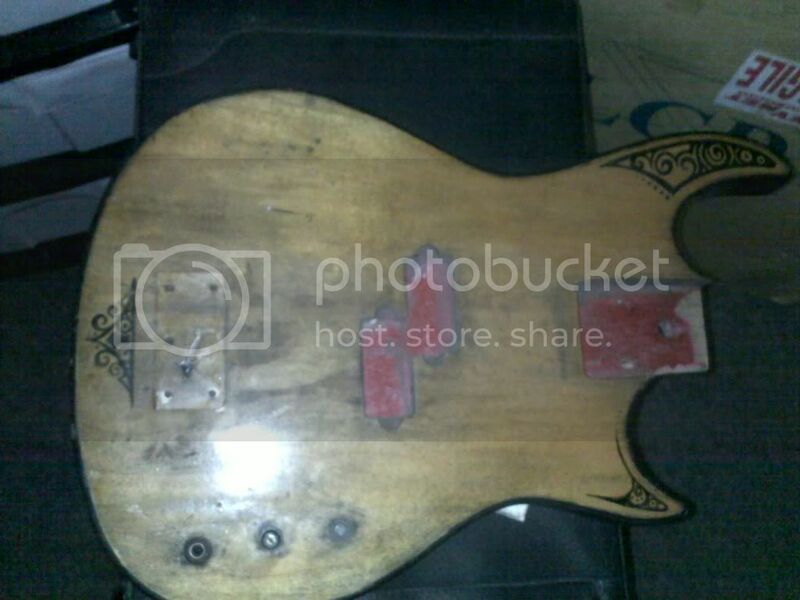 I have a really old Carson Bass, this thing is in really bad shape, it hasn't been playable for at least 10 years because the neck is so warped that the strings touch the frets all the way down to the 11th and 12th frets. Anyway the neck is busy being sorted out so I thought I'd change out the electronics because the pots and jack are so corroded and rusted that they will probably sound crap. 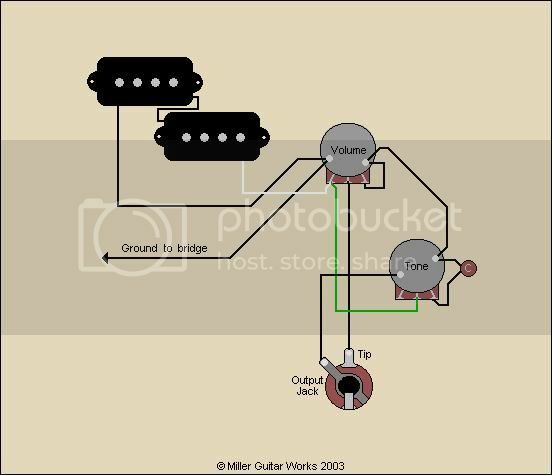 Anyway I found a wiring diagram and compared it to how mine is wired and things seem a bit off, what I want to know is should I wire it as it currently is in the bass when I get the replacements or is it safe to wire it according to this standard diagram I have found? (excuse my gimp skills ) this is the capacitor that is soldered to the (tone?) pot and the pots are 500k. Either way is fine. Essentially the same aside from phase of the pickup, which doesn't matter in a single pickup instrument. Ok thanks, I might as well wire it up the way it was then. Just another quick question, I put everything back together and it's working fine, just the volume is very low, I have to crank the volume knob all the way on my amp to hear it play at a volume around 25% of what I would get out of my electric (when I crank it almost halfway it's insanely loud normally with my Ibanez RG321mh). But what I noticed is that when I plug the bass into a pedal (I have a flanger and a metal zone pedal, it doesn't matter which I plug in) the volume is MUCH louder ,which is what I want , even if the pedal is dis-engaged (ie the led is off) but plugged into the power, then its window rattling time just about. Is this normal for bass pickups to require a pedal to play loud or could there be something else wrong? I have a Vantage 50W Combo amp with hi and low (I use the low for the bass and hi for my Ibanez) inputs , it's very old so maybe that's also the issue? I have in the past plugged in into the hi input to test and the volume remains the same. And after (I know it doesn't LOOK much better, but I straightened the neck with steam and weights (and had to loosen the truss rod because someone tightened it so much that it put a crack in the neck) and sorted out the tuning heads,redid the wiring, nut, bridge, jack (shiny! ), adjusted the pickup heights and put on some new strings. Sounds awesome when it's playing at the right volume!) It's obviously been sanded down a few times before because I went straight through the wood grain layer on the top in some sections with my trusty sander,oops... Guess I'll have to paint it black or something at a later stage. Try it with some other amp. Lotsa pedals use what is called 'buffering' where your guitar signal is not amplified, but given more power. The guitar pickups are no longer driving the amp front end, the pedal is. It might be that there is something wrong with your amp front end, which makes it hard for an unbuffered bass to put enough voltage into the amp. You would find out soon enough trying the bass through another amp or trying another bass (not active) through yours. Have you tried the guitar without pedals? Alternatively, if it is in your bass, the pickups have too low impedance because of a short or something. If you were to try to measure the DC resistance of the bass it would tell us more. Gearhead wrote: Have you tried the guitar without pedals? 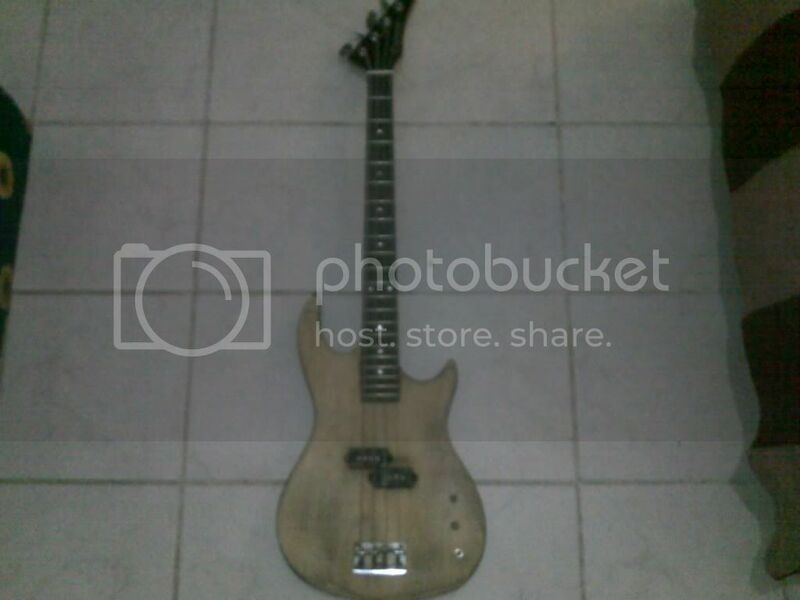 Do you mean my normal electric guitar? It has just dawned on me that I haven't really played without the pedals, but after a quick test it seems to play almost as loud as it does with pedals, so it's not a huge drop but there is definitely a slight drop in volume. Gearhead wrote: If you were to try to measure the DC resistance of the bass it would tell us more. Plug a lead into the guitar and measure between the tip and the sleeve of the other end of the lead. This takes everthing you plug into the amp into account. For fault finding purposes, you could try measuring after desoldering the pickup, between the hot and the cold of the pup and see whether it differs (but that is only if the overall resistance is funny). Tsk tsk. Metal player, right? Gearhead wrote: Tsk tsk. Metal player, right? My meter is kinda crappy , but it looks like I'm getting 13 - 14 on the 20k setting on the lead. Does that sound right? Does mean that chances are it is not in your bass. Might want to just play the bass through a pedal with a clean tone setting for now and look for a second hand bass amp. P-Bass pickups are usually around the 9-11K range, but can be (and sometimes are) wound hotter. The volume pot will bring the measured value down a little if you measure from the lead. So it's not far enough off the expected range to suspect pickup or wiring. DC resistance doesn't tell you if the magnets are OK or if the pickup is adjusted high enough. Check the latter (as a general rule the pickup should be as close to the strings as possible without causing wolf tones when playing in the upper registers) and if you need to get the pickup higher, add or replace the foam rubber under the pickup using draught excluder (basically foam rubber with a single adhesive side - available from any hardware or auto supply shop). Always use the high input for a passive bass. The gain should be lower on the Lo input and you should only use it if you need to get more clean headroom from a hot instrument. Ok thanks l will try to find another amp at some stage if I get bitten by the bass bug and really get into it, but I will plug it in and play it through the pedal for now. I'm actually thinking of stripping the bass down again and finishing it properly now that I know that it plays ok.
Alan Ratcliffe wrote: Always use the high input for a passive bass. The gain should be lower on the Lo input and you should only use it if you need to get more clean headroom from a hot instrument. It is a bit louder and cleaner when I plug it into the High jack, thanks for the tip. Thanks for all the advice guys, I'll post some proper pics when I'm done .